The Construction Framing Assistant Workforce Training program was a project that emerged from an industry demand for skilled workers coupled with the community’s desire to design and pilot an approach to serving unemployed persons who are homeless in Utah’s capital, Salt Lake City. This was a highly successful project that rises to exemplary because of its collaborative nature and innovative approach, as well as its success with a traditionally difficult-to-engage population. Salt Lake Community College (SLCC) is the only community college in Utah and leads the state in workforce training. 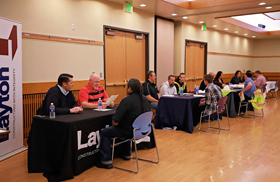 The Division of Workforce & Economic Development team at SLCC has a successful history of engaging industry representatives to inform the development of curriculum that prepares individuals for careers in high-demand industries within the state. The Division creates new courses and programs within timelines that are responsive to industry need. The modalities and schedules in which this programming is delivered are also strategic and designed to serve individuals and businesses, as well as support the economic development goals of Utah. SLCC also works closely with government agencies and non-profit entities with missions that include serving disadvantaged and under-served populations, including individuals who are unemployed under-employed. This project brought the expertise of many stakeholders together in order to address a number of critical community issues. The building construction industry within the state is experiencing tremendous growth. Both large and small companies have been unable to adequately staff their operations. Workers with basic construction knowledge and skills were nearly impossible to recruit. The Mayor of Salt Lake City identified reducing homelessness as a priority of her administration. SLCC acted as the convener, identifying and bringing stakeholders together. These stakeholders included city officials, service providers and employers. Entities included representatives from state and local government, non-profits, higher education, and for-profit employers. SLCC also served as the expert in program development and deployment, working with industry to develop the curriculum to ensure appropriate program learning outcomes. The modality for delivering the program was an approach specifically designed to serve unemployed individuals who were also homeless. Wrap-around resources were identified and coordinated in order to support student success. Public and private funds were secured in order to offer a no-cost to participant program to the students, including tuition, instructional supplies, safety gear, tools, workplace clothing, transportation, housing and food.